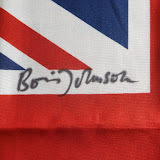 We are pleased to continue our fund-raising efforts on behalf of The Prince’s Trust with our project to get a Union Flag signed by as many eminent British figures as possible, and then auction it. Our flag is off to a flying start with a first signature by Mayor of London, Boris Johnson. Our hit list of signatures currently includes: David Cameron, Mary Portas, Hugh Fearnley-whittingstall, Jamie Oliver, Sir Tim Berners-Lee and many many others. Wish us luck!